A roller audit will determine your anilox screen, volume, cell quality, cleaning requirements or possible damage. Plus, we provide repair suggestions. ARC International can also provide you with the materials and instructions for auditing your existing inventory of anilox rollers. 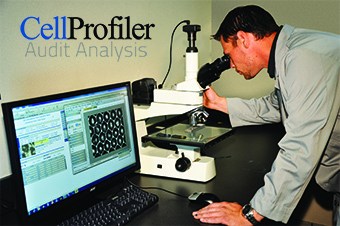 This easy-to-follow manual, gives you step-by-step instructions for auditing your rollers and preparing replicator tape samples for analysis. All roller audits are fully evaluated by highly qualified lab technicians using Opti-check™ scopes and 3D-QC interferometry devices. 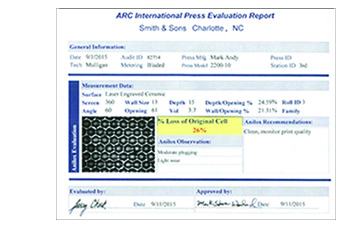 Your full report will be sent to you with an explanation of the results by an ARC team member. Knowing what you have and more important, being able to monitor the condition of your Anilox roller is vital if you are to take control of your inventory, reduce your ink consumption, maintain your print quality and reduce your scrap. Our technical field service personnel can carry out a more in-depth audit of your rolls onsite. Upon receipt of the impressions, we will carry out a full evaluation and recommendation for each roll. These reports are then posted on your private site that you can access whenever you need to refer to this information.